Dating from 1856, the venerable Kulm Hotel put St. Moritz on the map as a winter destination. The history of winter tourism and deluxe hotels in St. Moritz can be traced to the opening of the Kulm Hotel in 1856. Its Grand Restaurant enjoys an extraordinary status as the first place with electric lights in Switzerland in 1878. 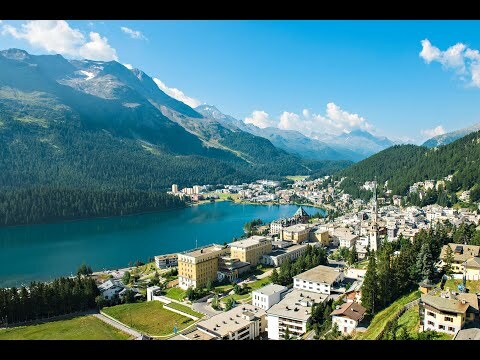 Since then, St. Moritz developed into a top ski resort. The gorgeous views of the Engadine valley and lake impresses all who visit, and the historical and traditional style combined with heartfelt service reflects the warmth of the hotel. The hotel facilities include a nine-hole golf course, three outdoor tennis courts and the Kulm Spa St. Moritz for guests’ enjoyment. The Marmotta Club provides our younger guests with daily activities. In summer, the Engadine valley offers a wide range of activities such as hiking, mountain biking, adventure sports and fantastic mountain lakes for sailing and windsurfing. See behind the curtains and watch Chef de Cuisine Mauro Taufer in his element as he prepares culinary delicacies in the historic Kulm kitchen. Famed as the oldest golf course in the Alps, the 9-hole Kulm Golf Course is nestled harmoniously in the alpine landscape, a two minute walk from the hotel. 8.3km/5.16mi from Samedan Airport (SMV); 261km/162mi from Zurich International Airport (ZRH); 1.1km/.68mi from St. Moritz Rail Station.